I’m a big fan of the robotic vacuum cleaning Roomba, but he doesn’t help with all the crumbs and keyboard fluff on my desk which is where the new (and unrelated) Robo Vacuum come to the rescue, a robotic cleaner for your desk. Picking up life’s little messes is easy with the Robo Vacum™! 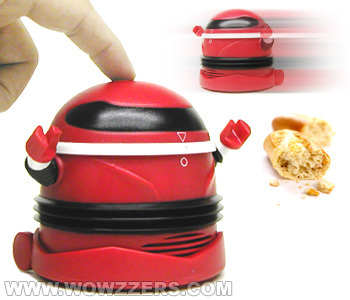 This tiny desktop robot is a perfect for sucking up those kitchen crumbs and desktop debris. It’s easy to use and easy to clean! Simply push top button to activate the vacuum and slide over dry crumbs and other debris. No vacuum bags required! It hold all of the debris in it’s crumb compartment. Just pop open the top and empty it out! Robo Vacuum is available now from WowZzers for $18.99. You’re a fan of robotic vacuum cleaning Roomba, I’m an fan of Robot Vacuum Cleaner for office and home. We always use this machine from Shenzhen Yiceda Electronics Technology Co., Ltd. in China. It has user-friendly functions, which make us even lazier but more convenient in our daily life. For example, it’s good looking, and can recharge by itself, a remote controller to direct. How amazing! You can take look too! http://www.yiceda.com. It’s a creative company and have wonderful products!